Do you know the difference in "Half-Round" and "Comfort-Fit" wedding band styles? 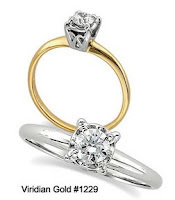 This is a common point of confusion for those in the market for genuine Platinum or Gold wedding bands--the difference in style may not be apparent at first glance, but the cost difference is apparent! This price difference is due to the weight of the precious metal, as well as the extra complexity of the comfort-fit style. It all boils down to the difference in the cross section of each style. As the illustration shows, the half-round style is flat where it contacts the finger, but domed on the top of the ring. However, the comfort-fit style is slightly domed against the finger, as well as on the top. Because of this slight domed-effect on the inside of the ring, the comfort-fit style will slide more easily over the finger joint than the half-round. 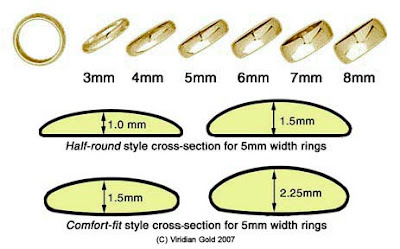 This difference translates into a ring whose cross-section is thicker in the comfort-fit style, making the ring heavier: the result is more weight of precious metal, and therefore higher cost. 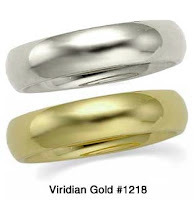 In addition, Viridian Gold offers both a standard weight, and a heavy-weight version of each style. The diagram shows that for the standard version, shown on the left side of each cross-section, the ring thickness is less than for the heavier version. Again, this translates into a difference in weight--the standard version contains less precious metal and is therefore less expensive than the heavier style. Most people will find that the standard comfort-fit version offers added comfort over the traditional half-round style, but still provides a ring with "heft" and quality thickness. 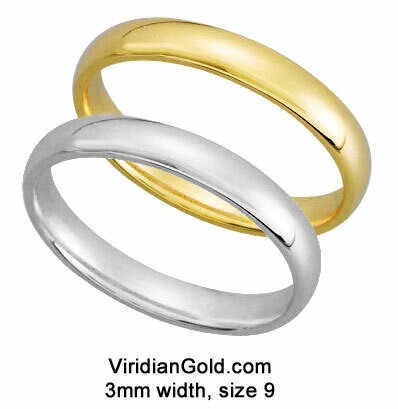 You can find both 14K Gold and genuine Platinum wedding bands on our website.